Heat oven to 375°F. Line large baking sheet with cooking parchment paper, or spray with cooking spray. Unroll pie crust on baking sheet. In small bowl, stir together cream cheese and 4 teaspoons of the pesto. Spread cheese mixture over pie crust to within 1 inch of edge. Arrange spinach evenly over cream cheese mixture. Sprinkle onion over spinach. Arrange tomato slices in single layer over onion. Carefully fold 1-inch edge of crust over filling, pleating crust every 2 inches. Brush remaining 1 teaspoon pesto over edge of crust. Bake 20 minutes. 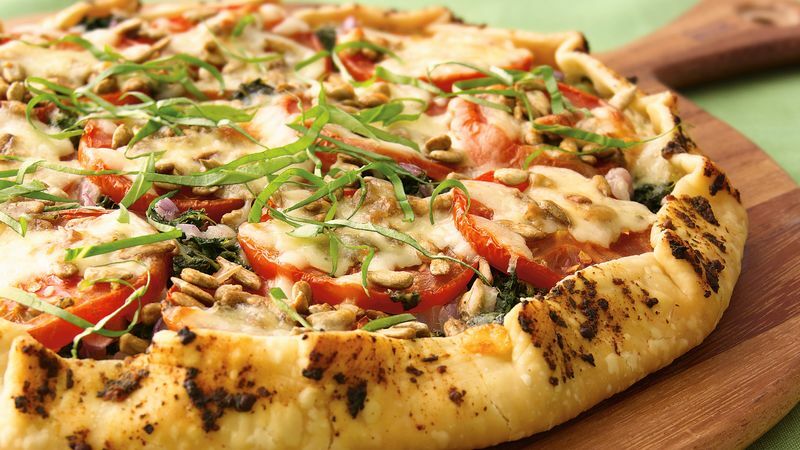 Remove from oven; sprinkle sunflower kernels and provolone cheese evenly over filling. Bake 12 to 14 minutes longer or until cheese is melted and crust is light golden brown. Cool 15 to 20 minutes. Sprinkle with sliced basil leaves. Cut into 12 wedges. *Two slices regular or smoke-flavoured provolone cheese, cut into 1 1/4x1/8-inch strips, can be substituted for the shredded provolone cheese.